A Migraine Diet such as the Migraine Miracle, outlines a dietary prescription that works for neurologist and clinical researcher Josh Turknett, MD’s patients. If you suffer from migraines, you know that these severe headaches can strike at any time without warning. Pharmaceutical medicines can only provide limited relief and there is no real cure for the condition. Following a simple meal plan may be the answer to become free of migraines for good. Dr. Turknett draws on scientific research to increase your knowledge about migraines and offer practical solutions. What happens in the brain during a migraine headache. The link between inflammation, diet and migraines. Risks and benefits of migraine medications. Alcohol, caffeine, chocolate, MSG, processed meats, aged cheese, milk, citrus, bananas, onions, nuts, bread and artificial sweeteners. Every migraine sufferer will not be sensitive to all of these foods. You can keep a food diary to monitor your reactions and help identify which ones affect you. Alcohol is a major factor for just about everyone, especially when consumed in excess. This migraine diet presents an eating plan that has been demonstrated to reduce the occurrence of migraines. It is similar to the Paleo Diet and emphasizes animal protein, vegetables, berries, nuts and healthy fats. A 21-day meal plan is included to help you easily transition to a new way of eating. Carbohydrates are limited to less than 100 grams a day for at least the first two weeks. If you have more then ten migraines a month you should limit carbohydrates to less than 50 grams a day. These migraine diet foods generally do not trigger migraines.Beef, lamb, chicken, trout, salmon, bacon, eggs, Greek yogurt, ricotta cheese, coconut milk, almond butter, cashews, berries, grapefruit, avocado, lettuce, tomato, peppers, mushrooms, kale, sweet potato, tamari, Dijon mustard, coconut oil, dark chocolate. Regular exercise has been demonstrated to be as effective at preventing migraines as the best available prescription medicines. Around twenty minutes of moderate exercise, three times a week, is all you need. 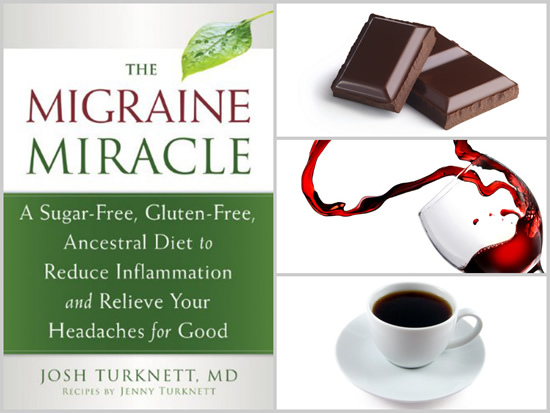 The Migraine Miracle: A Sugar-Free, Gluten-Free Diet to Reduce Inflammation and Relieve Your Headaches for Good retails at $16.95. May alleviate migraines without the side effects of pharmaceutical medications. Offers an alternative for migraine sufferers who have not found relief with conventional medicine. Includes a 21-day migraine diet meal plan and recipes. Addresses lifestyle factors that can contribute to migraines. Can improve a range of other health conditions including digestive problems and arthritis. A migraine diet requires elimination of many foods. Necessary to keep track of the diet and monitor your responses to individual foods. Requires time and effort for meal preparation. May take up to two weeks or longer to see results. Encourages consumption of foods high in saturated fats. Not designed primarily as a diet for weight management. This migraine diet offers a natural approach for the prevention of migraine headaches based on diet and lifestyle adjustments. By identifying trigger foods and changing what you eat you can reduce or eliminate migraines without pharmaceutical drugs. Many have found relief using this approach. Turknett, J. (2013). The Migraine Miracle: A Sugar-free, Gluten-free, Ancestral Diet to Reduce Inflammation and Relieve Your Headaches for Good. New Harbinger Publications.